i LERVE toe up socks. I hope you enjoy them that way too! You go girl! It's finally drizzling a bit here and I think I'll try to knit some. I'm very torn between Angee (You'd get to use your new book), or one of the many toe up seamless patterns available from Wendy D. Johnson. She's got lots to choose from either free or from her toe up book - Socks From the Toe Up. I you've inspired me to try this new method for my next pair! 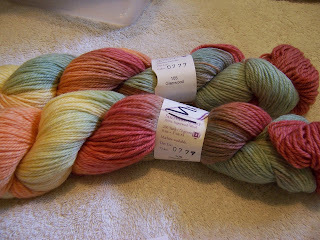 That said.....surprise me and knit what pattern calls to you when you're ready to cast on.